People comment that they often find a note or accord that seems to run in common between multiple scents in the same line. For example, people talk of the Guerlinade base, or the Tauerade base, or the way the Chanel brand’s style is associated with aldehydes. I can’t speak for other brands, but I’d like to address this notion a little bit with respect to my own line. There is no single ingredient that is in all my scents other than the alcohol base. The aromatic ingredients are formulated from scratch for every scent, with no standard “base accord” used in common. In fact, I’ve not made my own accords to use in scents the way many perfumers do; that is, I formulate a new “amber” or “musk” or “sandalwood” accord for every scent rather than blending one standard accord to use repeatedly every time I need “amber” or “sandalwood” etc. This approach takes more time, but it allows me to customize each scent to try to avoid a sameness from one scent to another. That said, I obviously have some likes and dislikes, so labdanum, sandalwoods, cedars, and musks find their way into many of my scents. The exact ingredients and accords are different, but if you tend to dislike some of the notes that I use frequently, you might need to eliminate a number of my scents from being possibilities for you. And even if you do like the notes and ingredients, if your sensitivities are radically different than mine, the scents might not be balanced to your taste. I think part of the reason we have favorite perfumers is because our scent receptors have a lot in common with theirs in terms of our sensitivities. I’ll give some examples to help you understand a little more where I’m coming from. Let’s briefly talk about ingredient accords for musk, sandalwood, amber, and cedar. When I add a musk accord to a scent, I can choose between the 11 synthetic musks I currently stock (like muscone, isomuscone, cosmone, ambrettolide, muscenone, velvione, habanolide, etc) plus the many natural ingredients I stock that have musky facets (like labdanum, angelica root, and ambrette seed). I can then add animalic facets to the musk accord with items like castoreum and/or civet and/or para cresyls, etc. I will usually choose several of the synthetics and several of the naturals to include in the blend. Each synthetic musk has a slightly different character and those variations determine which I choose for any particular formula (synthetic musks have different degrees of powder, sweetness, floral notes etc). At first I did not realize how common it was for people to be anosmic to some musks, but more recently I have been trying to make my blends work whether people can smell musk or not. I’ve not yet found a musk that I can’t smell, and even though I’m not anosmic to them I’m also not overly sensitive to them so they don’t cause me headaches or block out the rest of the scent as they seem to do for some folks. Other accords work the same way. A sandalwood note might be composed of several of the many synthetic sandalwood ingredients I have (things like Javanol, Polysantol, Ebanol, etc), plus several of the natural sandalwoods I have (currently Mysore, New Caledonia, and Australian). An amber accord might be built with a synthetic or two (things like Ysamber K, Timberol, Cedramber etc) plus many naturals (like labdanum, benzoin, tolu, vanilla, spices, woods). A cedar note might come from a mix of natural sources (like Texas, Atlas, Virginia) plus a synth or two (like CedrAmbre, ISO E Super). I literally have hundreds of ingredients, both synth and natural, so the possibilities for new combinations are nearly limitless. 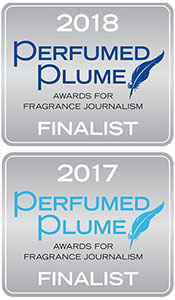 Sometimes one scent will lead to an idea for another, for example the plum note in Wood Violet led to the idea of Vintage Rose. If you dislike the plum in one you may dislike it in both. A number of my earlier scents used ISO E Super, but I’m using that less often now because it seems to have been overused in perfumery. ISO E Super is very useful at times though; if we were to give up ISO E we would lose modern classics like Feminite du Bois and Terre d’Hermes. ISO E causes problems for some people, either coming and going or smelling like pickles. To me it is very steady, with no disappearing act, and it has facets of cedar, amber, musk, and floral. I always try to keep an open mind, realizing that no single scent will work for everyone. I try to tweak my formulas to work for as many people as I can, but it’s not possible to have a 100% hit rate. I’m sure that my scent preferences and my genetic receptor sensitivities do set up a certain style that is recognizable, but it’s not because I’m intentionally using some standard ingredients in every scent’s base. I’ve found some people dislike ISO E Super or Javanol or labdanum or certain musks or heliotrope or something else, and I can help steer them away from sampling those scents that contain their kryptonite ingredients. 🙂 And by the way, I do have my own kryptonite ingredients. I can’t tolerate much in the way of ozone or melon, even the mild ozone in green synthetic notes and lily of the valley aroma chemicals. I also think my style is evolving as I go. I’m trying to use higher and higher levels of naturals, and I’m using less synthetic musk. I’m also exploring some new territory — I’m currently working on my first scent with a noticeable civet note, and I have plans for a couple dry masculine scents. There are always new things to learn, and I hope to keep building and improving as the years go by. I forgot to mention that some ingredients function as part of several accords since ingredients generally have multiple facets to them. For example violet leaf adds to the green notes and the leather notes in a scent; jasmine adds floral and animalic notes; Javanol adds sandalwood, musk, and some vague floral notes; ISO E Super adds cedar, amber, floral, and musk-like notes; osmanthus adds floral, apricot, and leather notes, etc. I don’t think of each ingredient as part of just one accord; I tend to think of most ingredients as belonging to multiple accords. I suppose each perfumer has a different way of working though. You could assign ingredients to the note/accord they contribute to the most and just realize they will influence other accords as well, but I tend to view the whole formula as an entity instead. I do sometimes break pieces of a formula out to work on separately for a while — maybe the heart or the base or the floral notes etc. I don’t formulate in pieces that I then try to put together at the end though. And when I gave the little examples above, those weren’t meant to be exhaustive. A typical sandalwood accord would include other things besides sandalwood ingredients, like ionones, creamy notes, possibly vetiver and cedar and musk, etc. Again, those auxiliary notes are playing multiple roles in the formula. It sounds complex, but it’s more intuitive once you start playing with ingredients, and I’m probably not explaining it very well. I’d have to work on a write-up for a while to make a better organized explanation, and I’ll save that for another day. What an interesting post! The overall topic–of a perfume house’s signature base or ingredient (in addition to your examples, I find Ormonde Jayne’s quite noticeable)–is fascinating. I loved reading your take on the question, especially your clarity about why you aren’t interested in establishing such a common thread among your perfumes and how you go about creating a novel scent experience with each fragrance. I was also quite intrigued by your discussion of how you create–and realize anew for each scent–specific accords. So interesting. Thanks for giving us a peep into your creative world! Glad you found the post interesting. One of my main goals for my line is to try to create scents that have a naturalness to them, without a synthetic vibe. Even though I use synthetics, I’m picky about them and don’t use the ones I find too synthetic smelling. That’s just to my taste though — other people might find a different subset of ingredients that they dislike. I like to use plenty of naturals but make use of synthetics that are beautiful to me in their own right. Another goal is to make scents that remain interesting after the first couple of hours; it’s not hard to make something that is beautiful for two hours, but it is much harder to make something that is still smile-inducing after several hours. I’d also like my line to have some diversity to it. I’m still working on it! Thank you for sharing more of your thoughts on this! I was so excited reading what you said about your goal of creating scents with a “naturalness” to them, even tho you do use some synthetics. That’s EXACTLY how I perceive your scents. I am a huge fan of all-natural scents and find your fragrances have a similar roundness and warmth…yet with (much) greater lasting power. (And lasting complexity.) Perfect combo, in my opinion. Thanks for expounding on this. I wouldn’t have thought to articulate what I love about your scents in the way you did, but it’s absolutely right on for my experience in wearing your perfumes. I also really enjoyed what you said about choosing synthetics you love; certainly, synthetics can offer things natural essences cannot, and I imagine it must be very inspiring to consider all of the tools at your disposal (natural/synthetic) and create the most interesting or beautiful thing from both. Thanks, again, for this window into your perfume-creation world. Thanks, Laurie. This was one of your most interesting posts for me. I find it fascinating how perfumers create, between all the different ingredients available to you, and also the fact that whatever you put together is going to be perceived by each person a little differently. I think I must be anosmic to at least some musks. What I think of as “musk” is influenced by what I wore as “musk oil” way back in the 60s. I think now it was probably more of an amber/sandalwood blend. But in my mind, that is what I think of when I think of “musk”. Interesting how that works. Great post. Thanks for pulling back the curtain a bit & giving us a peek into the mystery. Yes, musk scents typically have soft woods, ambers, vanillas, florals, and all kinds of notes besides just the musk ingredients, depending on the goals for the scent. Glad you found the post interesting! Many people are anosmic to some musks but can smell others. It’d be fun to offer bespoke scents so that people could choose the ingredients that work best for them. I’d like to do more custom work after I finish some things in progress. I’ve read other posts you have written letting us have a inside look on how a scent comes to be. I have been a perfume lover since I was a little girl and I love reading how you create your scents. I have followed you for a long time and my most special scents are yours. It’s more then smelling good it’s how I feel when I’m wearing it!!!! Thanks Laurie, wishing you all the very best in the coming new year! Yes, that’s exactly it — how you feel when you wear something that clicks for you. It can be such a mood lifter. Thanks, Beth! All best wishes to you too! Very, very interesting post. I’ve become much more interested over the past few years with the “nuts and bolts” of how perfumers work, and this post was fascinating. Oh, and I’m with you on those personal kryptonite notes! I think many people have trouble with ozone and melon, so I’m not alone in that. I avoid some pretty basic aroma chemicals because of that though. I do like natural greens (violet leaf, galbanum, moss) but the synth green floral notes that are ozonic are really challenging to me, not to mention things like Calone. Very interesting! I do detect a sort of “Ericksonaide” in many of your scents, but it’s really the woodsy ambery scents that have it, not necessarily the florals. Interesting to know that it’s built from scratch every time. P.S. I wore Vintage Rose yesterday and it was fabulous! I can still smell the drydown from the tiniest spritz. thank you for sharing these wonderful thoughts with us. Look forward to settling to my new accommodation and order some samples from your collection; your new addition Nostalgie touches a chord of mine, as I love vintage perfumes, and nostos is a Greek word with such emotional intensity about someone’s home, land, people… Merry Christmas, and may the New year be inspirational and productive! Thank you Alexandra! Hope you love your new spot, and hope you have a wonderful holiday too! I realized I’d glossed over the way ingredients contribute to more than one note in a scent, so I added a little addendum update to the post. The subject is complex enough to require a better treatment, but this post will give at least some info. Next year I’d like to do some more perfuming posts since there seems to be an interest in it. Love it when you turn to these topics. Always a fascinating ra:ead and helps us appreciate our fragrances more. Thank you for sharing. Thanks, Ann! I have had this post in mind for a while. Books on perfuming often suggest blending a top, middle, and base accord and then putting them together in whatever ratio is most pleasing, but I’ve never worked that way. It’d be fun to learn how other indies approach formulation. Just catching up, Laurie, and I loved this post. You’re as talented a writer as you are a perfumer! As you know, I’ve long been fascinated with both the process and the ingredients, so thank you for taking the time to share your knowledge with us. And just found this link on Perfume Shrine to an article about scent and our DNA! Very interesting and apropos. Thanks, Donna! Yes, I’d seen that article. It fits into the framework other studies have found too, in that a portion of our scent preferences seem genetically determined. It’s a fascinating topic. I think our genes determine a lot about how we smell aroma chemicals, and our experiences determine what associations we assign to them; therefore our genes and experiences combine to produce our scent likes and dislikes. I really enjoyed this post! It’s always good to get some insight into a perfumer’s style. I do smell something of a Sonoma-ade in many ( not all ) of the fragrances of yours I know, but it’s not so much a note as a texture; a certain dry, warm, non-sweet ”feel” in many of them. As for musks, none of your fragrances that I’ve tried have a certain accord I can only call ”laundry musk” for its presence in many detergents. I don’t know what it is, but it’s in even some very classy, well-thought out fragrances, where, after the first half hour, the notes fade away to this very loud, plain, clean-smelling note. Orange flower fragrances ( Neroli Portofino, Acqua di Parma Colonia Assoluta, even the intriguing Vero Profumo all seem to suffer to some measure ) seem blighted by it especially, which is one of the reasons I like your Jour Ensoleille so much ( as for the drydown there, I guess I could inexpertly describe as ”buttered floral woods” ). Galaxolide is one of the most commonly used musks in laundry products, so its scent is associated with them, but the issue is much deeper than that. I think the generic nature of some musk scents comes as much from the ingredients used with the musks as from the choice of musks themselves. Orange blossom notes usually contain some synths like methyl anthranilate, dimethyl anthranilate, and Aurantiol, which are nice in small amounts but smell generic and/or grapey if used too heavily. Lily of the valley chems like Lyral, and Lilial are also commonly used with musks for a fresh floral effect, and to me those smell quite generic unless used extremely lightly. Laurie, I love these types of posts and I hope that when things are a little less hectic you will be able to do them on a regular basis. I do enjoy musks which is perhaps why your fragrances resonate so much with me. I also appreciate that you do not follow the typical perfume formula (top, mid,base in expected proportions) but rather work instinctually. Perhaps this is what makes your scents stand out from the masses 🙂 I am thrilled to hear that you are exploring higher percentages of naturals as my secret wish is for you to one day make an all natural perfume! I’m very late to comment, but let me add to the chorus asking for more posts like this one. Reading your ideas about composing fragrance and learning about the compounds you combine fascinates me. I ran to go retry your Egyptian Musk immediately. Like hearing a performer or musical composer give a talk before a performance, reading your thoughts enriches my experience of the work. . .and I can simply enjoy the fragrance for how it hits my receptors. I’d love to read similar writings on your fragrances, sort of a master class on perfume composition, if the mood ever strikes you to muse on one of your creations in specific. As ever, I wish you the very best, personally, creatively, and financially in 2012. Be well.